Luckily, I broke my right arm and not my left, so I was able to draw my new line without much incident. Transferring it to the computer was tough (I use the mouse with my right hand), but not impossible. I'm SUPER excited about the product line and will be sure to post pictures from the NYIGF starting this Saturday. The new “Sammelan” line refers to Banga Sammelan (Bengali Festival), but lovingly called Sammelan. The gathering is an annual festival where the North American Bengali diaspora celebrate their "Bengali"-ness every year with families, friends, music, food and nostalgia about all things that have been Bengali in some other time at some other place. Of course, traditional Alpona adorn the halls at the Sammelan and the designer chose to capture and revive, in her products, this wistfulness for days past and traditions fading. The Sammelan line uses modern colors and pattern placement to capture time-honored shapes of traditional folk Alpona --a new and exciting take on Alpona for OM home. If you're at the show, come visit us at booth 5506 in the Handmade section. Broken Arm? Aaah. I Got to Ride a Camel! This picture looks CGI but it's real! I was riding a camel named Bob Marley and Sanj was on Jimi Hendrix. 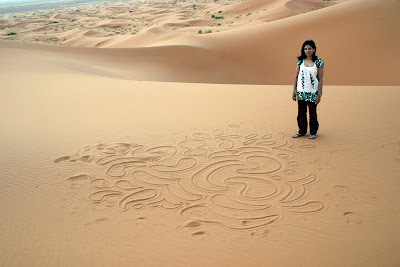 Our guide Rashid brought us to a valley in the Sahara Desert where we spent the night under the stars. It was a dream come true for me. The next morning we climbed up a 100 foot dune and watched the sunrise. Because I'm emotional and everything makes me cry, it should come as no surprise that the sunrise choked me up. Sanj, always loving, pinched my cheek and told me, "that's why I love you." I wonder if he thinks that when I cry during Reality Show finales? But I digress... Shortly after our return, I was riding my bike down the hill near my house, as I do everyday. I crossed the streetcar tracks, as I always do and then unexpectedly, my wheel got caught in the track followed by my face getting caught on the hot pavement. OUCH! Scaphoid fracture (the worst fracture possible), broken forearm (getting worse), twisted knee (will I be able to do yoga again) and multiple bruises. 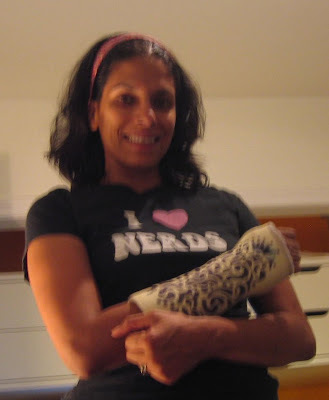 Eight weeks later, I am STILL in a cast. Seriously, in the last two years, I've learned to snowboard and surf, I rock climb and ride my bike all the time and THIS is how I break my arm? Coming home from grocery shopping? How anticlimactic. But tonight I am excited, not sad because tomorrow morning, my cast comes off!!!! !